The dark wine of the Skënderbeu Chardonnay. 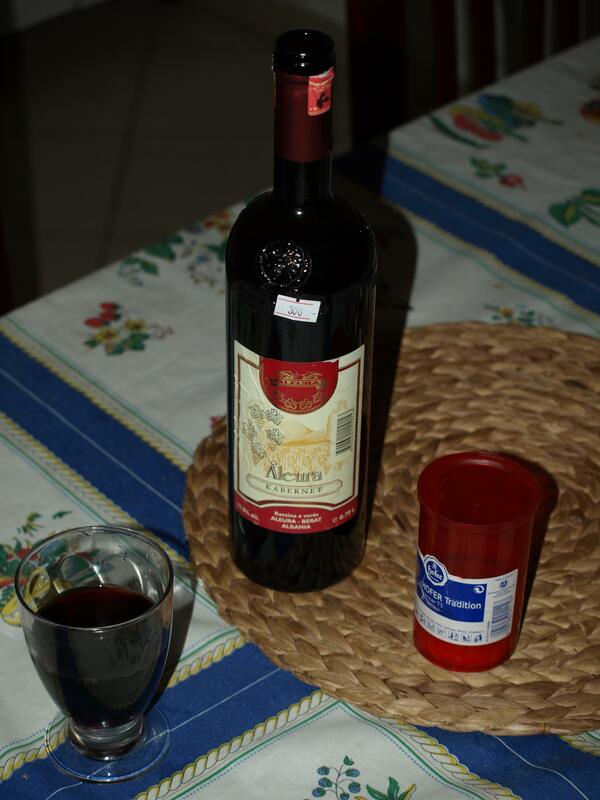 It was a good job I had a big meal before I went on my search for my second wine in Tirana. The place is am staying has any number of shops close by but getting a bottle of wine is not that easy and had to walk quite a way. But I succeeded. And it was with pleasure that I saw an Albanian Chardonnay in a little shop that had the biggest selection of Albanian wines that I’ve seen on this trip – might go back there to try something else. I like Chardonnays and, although I didn’t drink it at its recommended temperature, which I don’t (in this case think had any impact on my enjoyment, or otherwise, thought I could at least consider its merits based upon what I know about this white wine variety. As soon as I poured it out it was different. The Chardonnays I’m used to are normally ‘new world’ which tend to be a light, straw coloured wine, crystal clear and with a fruity aroma. This one has a fairly dark amber colour and although clear resembled more a sherry than a wine in look, and also in smell and taste. Again I’m trying to understand the wines but falling at each hurdle. If I have any expectations they get challenged as soon as the cork is out of the bottle. By chance this is also a local wine to Tirana, being grown in the region between the capital city and the principal port of Durrës, about 40 kilometres away. It is also a little bit more organised than some of the other producers in that there is a website. If you want to check it out click on Kantina Skënderbeu. Because I didn’t know what to make of this wine I went on their site to see what they said of what they produce, and it seemed that they consider it to be the Chardonnay I’m used to. So going for more information I’m even more confused. However, it seems that some producers are distributing an oak-aged Chardonnay and this certainly seems to fit into that category. And, after all, the description ‘light’ is relative. I am comparing with the crisp Chardonnays I’ve tried from Chile or New Zealand. They might be comparing with the brandies they also produce. 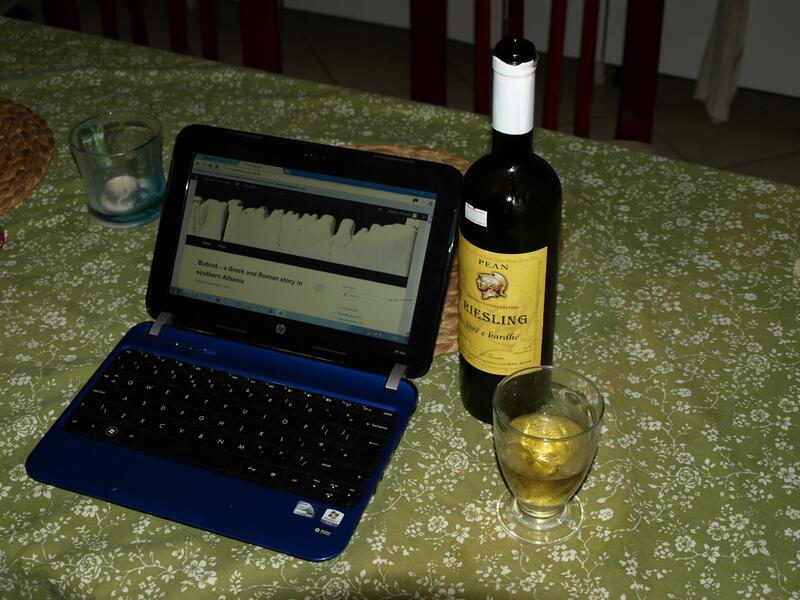 Had to keep a little over from the night before as I couldn’t get a good photo of the amber colour at night when I had to use the flash so – showing the immediacy of this blog – I’m typing this as I finish the last glass and a half. At one stage I thought that writing about Albanian wines was becoming to difficult, returning to a more positive approach at the moment and if I run out of untried wines and see the Skënderbeu I might try it again, if only to see whether this bottle is a one-off or whether it’s the norm. This is a strange wine. 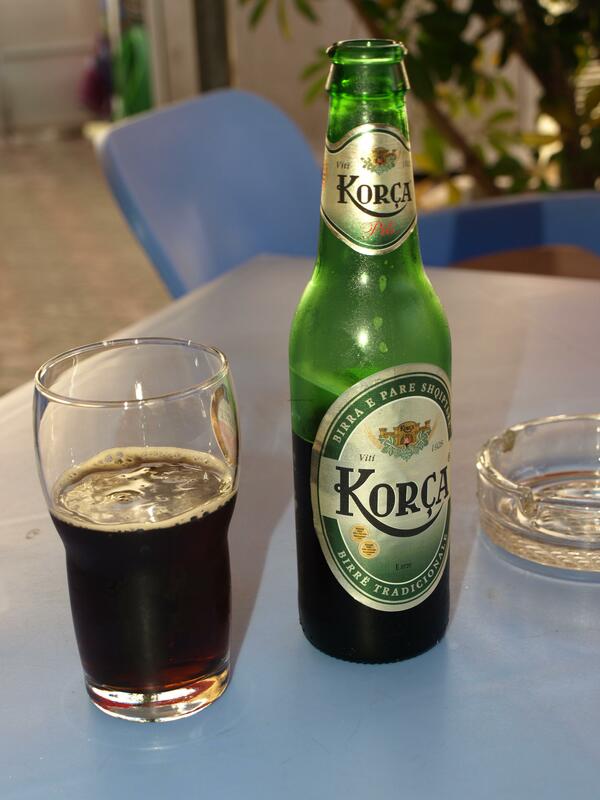 It comes from Berat (in the centre of the country) and has a similar taste to one of the local made, not for wide distribution wines, I tried from a local bar last year. That had a distinctive, if not to say, unusual taste. With that wine the distinctive, almost rustic flavour that sat on the tongue seemed to last until the end of the bottle. It wasn’t unpleasant but at the same time it wasn’t one that would make you rush out and buy another bottle the next night. (I paid, I think, L500 for a litre and a half), but none of it went to waste. That wine (and I’ll get back to the one I’m reviewing in a minute) had the sensation of a farmyard, as if the wine had been filtered through straw that had previously been used as the bedding for the horses. 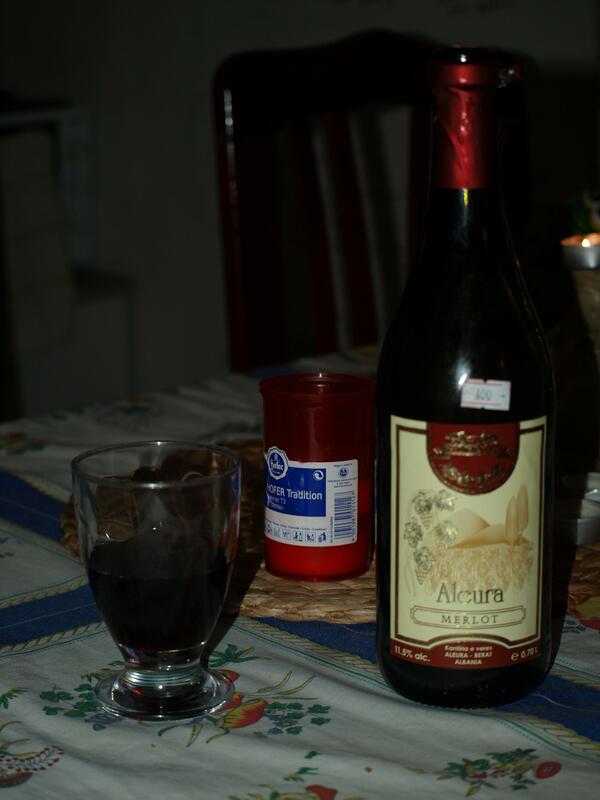 This Aleura Merlot brought back those memories. There was nothing wrong with the wine, it certainly wasn’t off or sour, but it was not what you might have expected. I’m used to the wines from comparable supermarkets in the UK being bright, sharp and with a distinctive taste. This one wasn’t – at first. However, as you became used to the uniqueness of the taste and the bouquet it started to settle down. It was quite fruity and had a cherry like taste. It was clear and looked good when the light was shone though it. It had no bad after-taste and produced no bad effects the following day and probably contained less sulphites and other nasty chemicals which are an integral part of our drinking experience in ‘Denominación de origen’ wines that we get offered at home. And as I wrote this review I realised why this wine smelt and tasted strange. We get wines that are filtered to death and lack authenticity. Our taste buds become used to that and forget what is the real taste of wine. 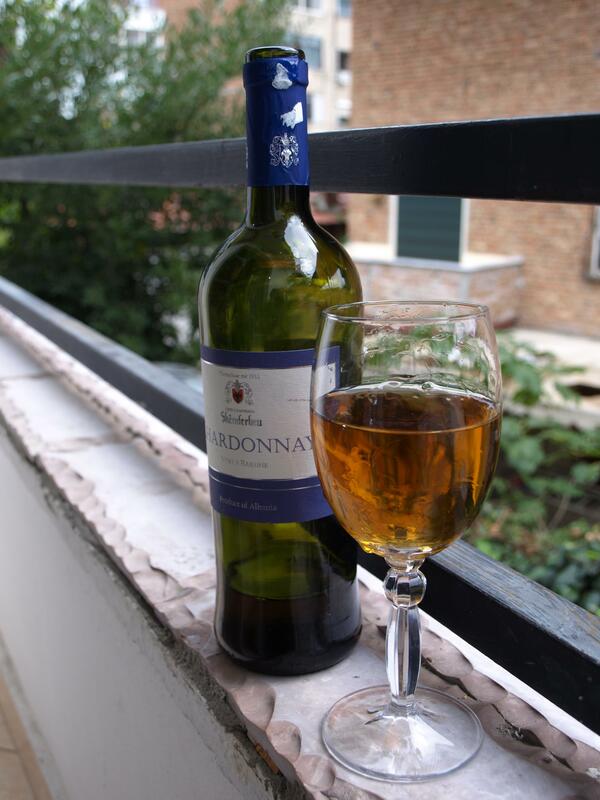 How many of us drink anything other than wines that have past strict EU ‘quality’ controls? After the initial ‘shock’ the wine settled down and as I got to the bottom of the bottle I considered it to be more than acceptable. Perhaps I should try chemical free wines more often and then get to know the real taste of wine? I’ll pursue this over the next few weeks. This was one of the more expensive wines I bought that evening (the equivalent of £2.30) but consider it was well worth the effort. You’ll never see it in the UK but if you get to Albania and see it in a supermarket or on a restaurant menu don’t pass it over for a much more expensive and bland ‘known known’. Experiment – you don’t know what you might be missing. Anyway, away from Albanian wines in general and back to this Kabernet in particular. I think a little bit of familiarity made the taste more quickly acceptable and although not really bursting any taste buds by the end of the bottle I thought it quite acceptable. This Kabernet, from the same producers as the Merlot before it, was a lot thinner even though it had a slightly higher alcohol content. I’m not drinking red wines on a regular basis any more and lack the ability to compare but even though this was not as ‘strange’ as the Merlot there was still something lacking. You don’t even get any idea of what it is going to taste like by the smell. There is nothing distinctive. Yes, its wine but that’s as far as it goes. Two things which came to mind when thinking about this review: I’ve not felt the effects of any of the wines the next day, even though there had been a mixture of the barley and the grape – and wondered if that had to do with lack of chemicals in the production; and how difficult it is to write a review of a wine, especially if it has nothing distinctive to talk about. Lacking a benchmark from which to start I don’t know if these wines are not as good as they should be due to too long a shelf life (possibly related to the lack of preserving chemicals in most supermarket wines in the UK) or just that they are ‘distinctive’ and cater for a taste somewhat different from my own. We shall persist and we shall see. A white wine ready for the creative process, perhaps! This was the first bottle of white I had tried on this trip and was looking forward to it, not least because I tend to drink more white wines than red. Before any comment is made about the choice of grape (Riesling in the UK, to those of a certain age, brings back the 1970s when Blue Nun was, more or less, the only white wine that was readily available in the ‘new’ supermarkets) this was the only white wine on sale in that particular supermarket. Here it might be worth mentioning that finding Albanian wines is not as easy as it sounds. Although the country has the potential to produce a huge amount of wine there is still a great deal of wine imported, especially from Greece but you can also occasionally find wines from Spain and Italy. They may be better wines, I don’t know. If I want to drink Greek wines then I’ll travel in Greece. It all fits into the so-called ‘openness’ of Albanian trade to other countries products, even to the detriment of the local production. Compare this to Spain or France, for example, where any request for a wine NOT of the country would be met, at best with a glacial stare or, at worst, would have you forcibly ejected from the store. So the Riesling was not chosen, it chose itself, being the only white on the shelves (and with this review I have now covered all the Albanian wines that supermarket stocked – at least at the beginning of November). This was also a more ‘local’ wine than the two reds, both from the Berat region, a bit further to the north. This white came from the region of Delvinë, a valley just the other side of the hill to Saranda, so virtually on the doorstep. This bottle had been kept in the fridge so was at a good temperature but the first taste was disappointing. It didn’t have the shock value of the two previous reds and was quite ‘normal’, it was just that it was somewhat bland, no distinctiveness, nothing that stood out. It was easy drinking but I was surprised that it was 12%, it didn’t seem anything like that. It went down easily and if my judgement is not enough a young Swede, who was also staying at the same hostel as me, considered it better than the Spanish wine he and a friend had drunk a couple of days before. Or perhaps my standards are too high? When I started this bottle I was watching an god-awful programme on Albanian television, so bad you can see from the image – the women come on between different stories, gyrate for a few seconds and then sit down, all the clever words being spoken by the two ‘funny’ male hosts. But don’t know if they had anything to say even if allowed to do so. After that I was without TV but with some nice olives with sweet peppers. Which would you choose to accompany your cheap plonk? This was the first wine I bought that made no pretensions for itself. In a plastic bottle, screw top and in quantity, a litre and a half. I had moved on from Saranda and was now in Himara, a beach resort in the summer (which is very, very short I learnt from talking to some people there) and the general price of goods in the supermarket was higher than Saranda, at least the wine – haven’t bought much general produce from shops of any kind yet. I don’t get the impression that Albanians are big wine drinkers when it comes to buying it in shops as opposed to drinking a home-made variety and the prices in the Himara supermarket reflected a market which were the outsiders. Wines I recognised (and had even reviewed above where a couple of hundred leke more expensive and so decided to go ‘down-market’ rather than start to pay the equivalent of UK prices. So the big bottle it was. And surprisingly good. OK nothing to wax lyrical about but I didn’t have to struggle to get to the bottom of the bottle as I have on a few occasions this trip. It, too, like the Riesling, came from the Delvinë region and there is no producers name on it. This was table wine that was meant to be drunk in large quantities without thinking too much about it. The Shesh I Bardhë is the variety of grape, bardhë meaning white, there being a red variety as well. And that’s all I have to say, really. I didn’t have any great expectations and it didn’t disappoint. And as even I don’t normally drink a litre and a half in one evening, after a few drinks in the day, this lasted me over two evenings, accompanying me in a deserted hostel (with the dogs and cats the only company) as I sat at the computer.